When I was growing up in the 1970s my sisters and I played in every room of our house — especially the living room. With four girls running from room-to-room then plopping on the sofa at the end of each chase, we put a lot of wear on the comfiest piece of furniture in our house. Mom said our home was lived in — no museum care taking or plastic covers over our green floral couch. She was easy-going about things like that. Of course back then when we were making forts in the living room with cushions, Mom didn’t know washable canvas slip covers could be sewn from painter’s drop cloths or I’m pretty sure she would have made them. Now that I have my family, I know how much work it is to keep our home looking tidy. We like to lounge, watch movies, eat buttery popcorn, read and wrestle with the dog on our couch, too. Or as my grandma used to call it… the davenport. 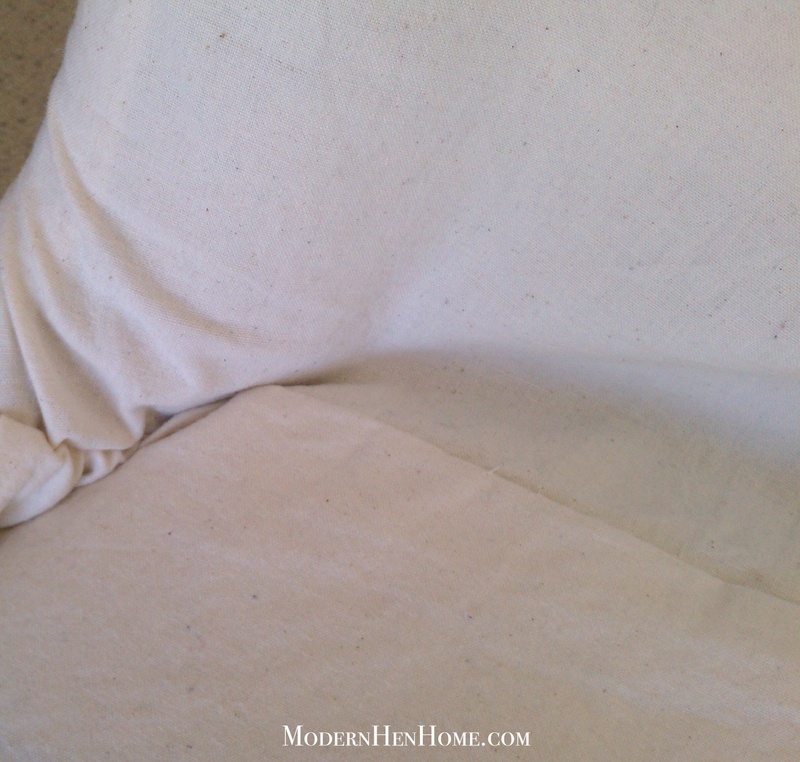 This imperfect slipcover works perfectly! Last week I shared with you this slightly worn writing desk chair I picked up at a church rummage sale awhile back. You can read more about it here. It’s an occasional chair primarily used by me and I wanted a slipcover for it. My sewing machine needed repair, so I hand-sewed one. By no means is this a professional instruction sheet, but these how-to tips should be helpful to you. Pick the right fabric. Consider color, fabric weight, durability, care, and cost. Lines and patterns are more difficult to keep straight. I used a curtain made from cotton linen. A solid, lightweight cotton fabric, pre-washed to prevent shrinkage may work best. Iron to remove wrinkles. Plan where your seams will meet. Follow the chair’s upholstery seams to guide your decisions for cutting and pinning. I made the back of the chair first, then attached the seat fabric, and the skirt last. Measure twice, cut once. Whoever came up with that advice is a genius! Begin by measuring the individual section you are working on. Since I had plenty of fabric, and it was my first chair cover, I allowed for 2 extra inches on all sides in case of error. Stitch from the top down. With the fabric on the back of the chair (inside out and pinned) sew a straight stitch from the top down, removing pins as you stitch. Remove the fabric and turn inside out. It should resemble a “pillowcase”. Put the case back on the chair to check for fit and tightness of stitching. Backrest cover is finished. 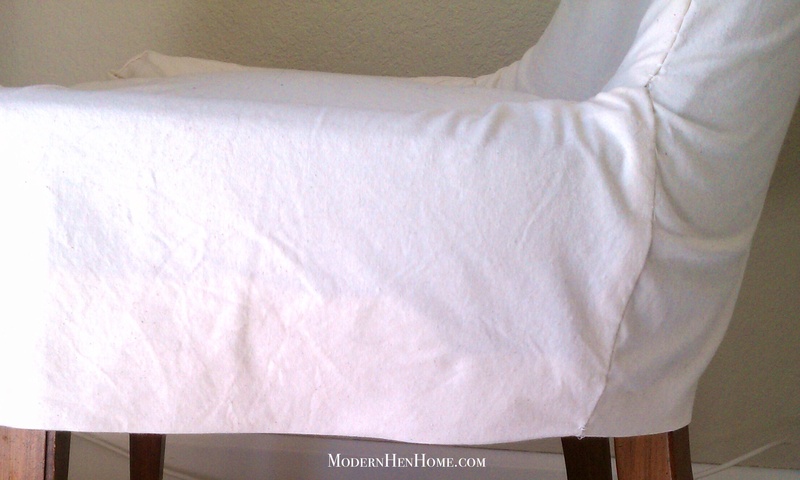 Remove the cover, turn inside out and put it back on the chair to add the seat fabric. Add the seat to the back. Measure and cut the next piece, using the chairs seams to determine where to cut. Leave at least 2 extra inches on all sides as the extra fabric may be needed to allow for sitting. If the seat is too tight, it could tear when sat on. This extra fabric will come in handy as you pin the seat to the “pillowcase”, and later to the skirt. As you pin decide how tight you want the seat. 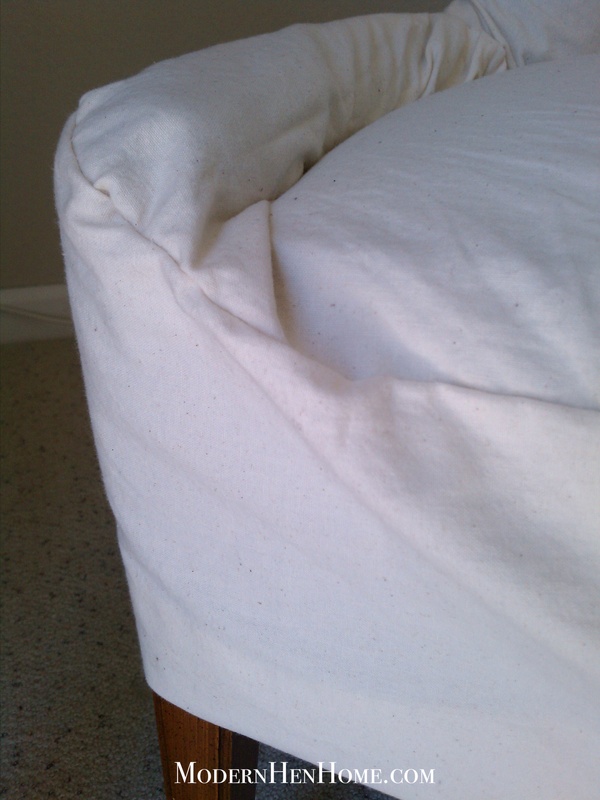 Keep in mind, slipcovers are generally fitted slightly loose. Stitch the seat fabric to the bottom of the backrest fabric. Determine the length of skirt. Adjust the back and seat fabric onto the chair. Tuck in fabric where needed around the seat and allow for a little extra fabric for sitting without tear. 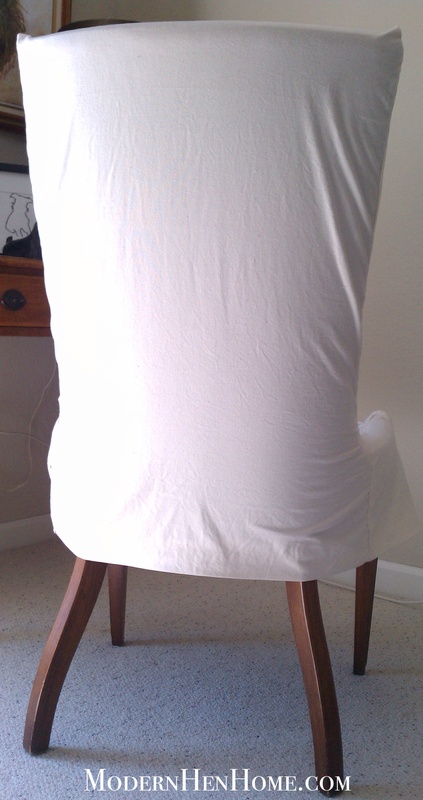 Be sure to add the length to match the back of the chair, plus 1 or 2 inches for hemming. Measure, cut and pin the skirt to the seat and back section fabrics, and stitch. Finish with hem. 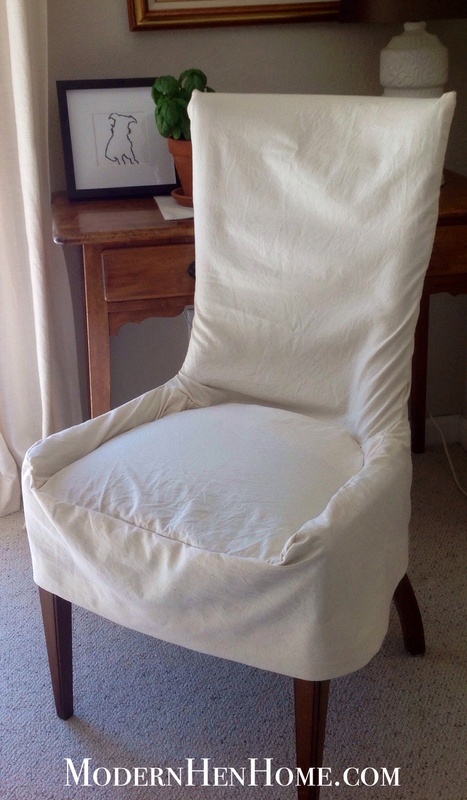 Turn the slipcover right side out and place on the chair. Check for errors, tuck in the seat to the back and measure the length of the skirt all the way around and pin the hem under every inch or two. Remove the cover, press the hem down with a warm iron to give it a clean edge. Once pressed, sew or fabric glue the hem and press again. I used fabric glue to avoid seeing the thread around the skirt as it’s more difficult to hide here. Ironing is key to a nice looking hem and slipcover. Your slipcover is finished! This slipcover is imperfectly perfect. 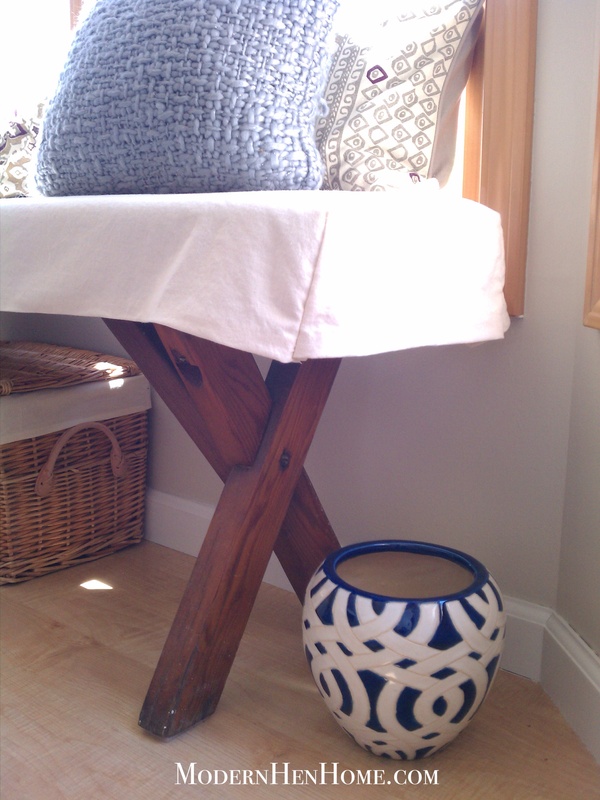 It serves its purpose to protect and change the look of the chair, is easy to wash or bleach if necessary, and is an inexpensive solution to replacing a piece of furniture. The stitches look just as they did the day I made it. If they do come loose, I can re-stitch by hand or machine. It was a lot of fun and fairly easy to make. 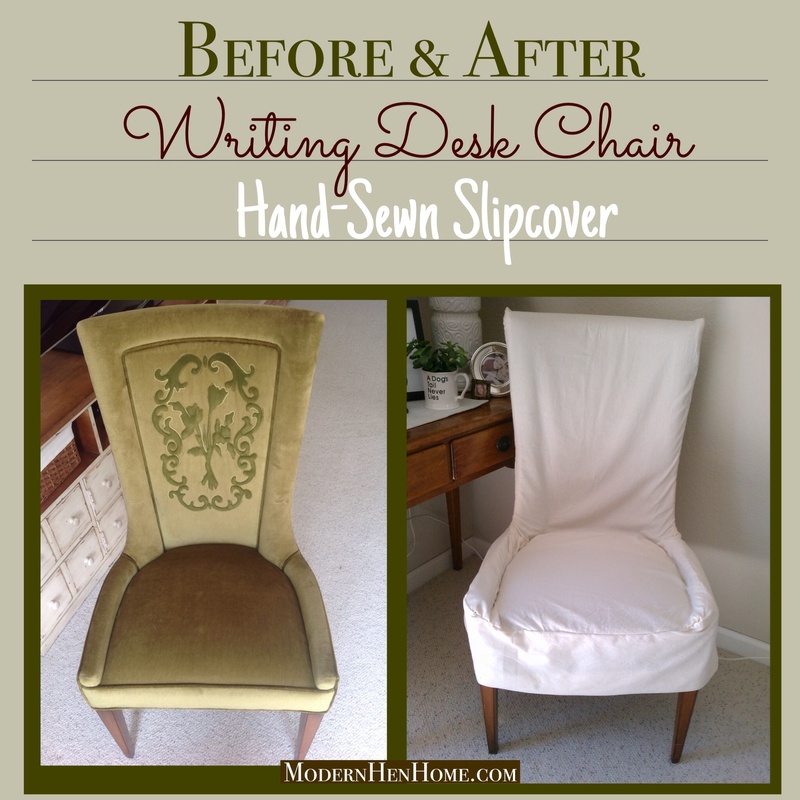 If you decide to make a slipcover, I would love to see it! Please be sure to Like this page on Facebook for more easy DIY projects & crafts, simple recipes and daily encouragement.